Peter Bryer: Mobile Foresight: Chrome begins to shine. Google's Chromebook is the one star in a shrinking PC market. And it highlights major shifts ahead. Chrome begins to shine. Google's Chromebook is the one star in a shrinking PC market. And it highlights major shifts ahead. Back in February, I wrote about the next potential screen of death for Microsoft: Google's Chromebook. ("Is MS about to be Wanged?" Feb 25, 2013). At a price of $249, the Samsung-made Chromebook is an extremely capable, super sleek, cloud-centric laptop. It's solid and secure, low-maintenance and high-value. Set it and forget it. But now it's getting tough to ignore. According to research firm NPD, Chromebooks dominated the low-cost segment of the U.S. laptop market during the half of 2013 with as much as 25% share. And according to Gartner, Chromebooks accounted for almost 5% of all U.S. laptop sales, up from around 1% — 2% in 2012. Considering that Samsung's low-cost Chromebook has been Amazon.com's top-selling laptop since December 2012, none of this is surprising. Americans are really learning that remote is the new local, and that thick-n-chunky, virus-friendly operating systems are a hindrance rather than a requirement to get things done. But now as the Chromebook is going global, significant changes can begin to alter the entire market for PCs and really provide a boost to cloud-based ecosystems. 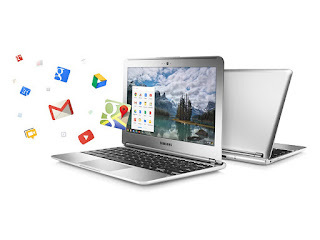 Starting back in April of this year, Google began selling Chromebooks in 10 other countries. Chrome OS might soon reach escape velocity and become a platform worthy of a lot more respect from developers who'll accelerate the shift of their focus to web-based technologies such as HTML5. Big changes are coming to the PC industry and Microsoft executives have certainly received the wake-up call: last week Steve Ballmer announced a corporate restructuring around "Software & Services." What's amazing about this new & improved Microsoft is the amazing parallels to the new & improved Nokia in 2006 when company executives promulgated its new organization focusing the future of the company on a P&L center called "Software & Services" to effectively compete against the GYM players (Google, Microsoft, Yahoo!). During the coming years we will certainly see many more major company adjustments, some of them late and desperate last-minute attempts to acclimate to the on-going cross-industry shifts which are underway. Some platforms will be abandoned, some new ones will be adopted, smart players will make successful business-model transitions, and some big names will fade fast. Chrome OS is one of the lights at the end of the tunnel.